CD154 and LFA-1 (CD11a) represent conceptually distinct pathways of receptor/ligand interactions (costimulation and adhesion/homing, respectively) that have been effectively targeted to induce long-term allograft acceptance and tolerance. In the current study, we determined the relative efficacy and nature of tolerance induced by mAbs specific for these pathways. In vitro analysis indicated that simultaneous targeting of CD154 and LFA-1 resulted in profound inhibition of alloreactivity, suggesting that combined anti-CD154/anti-LFA-1 therapy could be highly effective in vivo. Thus, we evaluated combining mAb therapies targeting CD154 and LFA-1 for inducing transplantation tolerance to pancreatic islet allografts. Monotherapy with either anti-CD154 or anti-LFA-1 was partially effective for inducing long-term allograft survival, whereas the combination resulted in uniform allograft acceptance in high-responder C57BL/6 recipients. This combined therapy was not lymphocyte depleting and did not require the long-term deletion of donor-reactive T lymphocytes to maintain allograft survival. 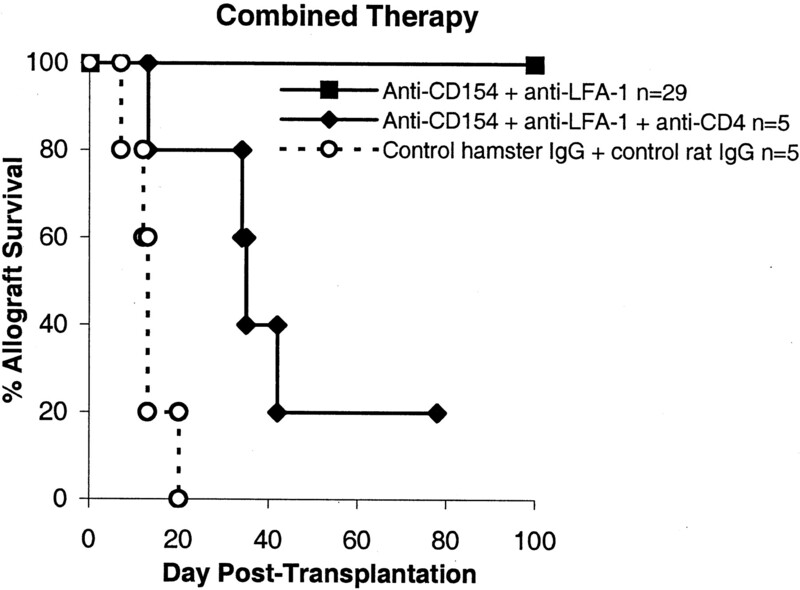 Importantly, combined anti-CD154/anti-LFA therapy uniquely resulted in “dominant” transplantation tolerance. Therefore, simultaneous perturbation of CD154 and LFA-1 molecules can result in profound tolerance induction not accomplished through individual monotherapy approaches. Furthermore, results show that such regulatory tolerance can coexist with the presence of robust anti-donor reactivity, suggesting that active tolerance does not require a corresponding deletion of donor-reactive T cells. Interestingly, although the induction of this regulatory state was highly CD4 dependent, the adoptive transfer of tolerance was less CD4 dependent in vivo. Islet transplantation has been shown to be a promising therapy for type I diabetes (1). A major continuing goal in this field is to develop increasingly safe and effective therapies that facilitate tolerance induction. Monoclonal Abs or other reagents specific for a variety of cell-surface molecules, such as CD4, CD8, CD11a (LFA-1), CD154 (CD40 ligand), CD45, and CD80/86, have been used successfully to prolong islet allograft survival (2, 3, 4, 5, 6, 7, 8). In the development of regimens for inducing transplantation tolerance, therapeutic strategies that combine two or more agents, such as anti-CD4 with anti-CD8 (9), anti-CD154 with donor-specific transfusion (DST)4 (5), anti-CD154 with anti-CD8 (10), and anti-CD154 plus CTLA4Ig (11), have been shown to have improved efficacy for promoting allograft acceptance and tolerance relative to individual monotherapies. Additionally, optimal tolerizing regimens may require simultaneous modulation of both CD4 and CD8 T cell subsets (9). For example, many tolerizing strategies that may predominantly target CD4+ cells are rendered less effective in rodent strains harboring vigorous CD8+ T cell reactivity, requiring adjunct anti-CD8 therapy for improved allograft survival (10, 12, 13). Avoiding gross lymphocyte depletion is an additional preferable feature of a tolerizing regimen, as this may minimize the risks of malignancy and infection associated with lymphoid ablation, such as that seen in the setting of T cell lytic therapy (14, 15, 16) or in therapies that result in sustained low CD4+ cell counts (17, 18). In the current study, we determined the relative ability of anti-CD154, anti-LFA-1, or combined anti-CD154/anti-LFA-1 therapies to accomplish islet allograft survival and tolerance. Results show that combined anti-CD154/anti-LFA-1 therapy was highly efficacious in prolonging allograft survival and in the generation of “dominant” transplantation tolerance not achieved through individual monotherapies. This combined therapy was transient and not generally lymphocyte depleting and induced a robust and consistent form of allograft tolerance in high-responder C57BL/6 (B6) recipients. Combined therapy was also effective in the presence of potentially graft-destructive alloreactive TCR transgenic 2C cells. Furthermore, the maintenance of transplantation tolerance occurred without a prerequisite loss of anti-donor proliferative and CTL activity. Finally, whereas the generation of the tolerant state was CD4 dependent in vivo, the expression (i.e., adoptive transfer) of dominant tolerance was less dependent on CD4 T cells. Taken together, simultaneous targeting of CD154 and LFA-1 can lead to robust allograft acceptance and the induction of dominant transplantation tolerance without a requirement for a persistent deletion of alloreactive T cells. C57BL/6J (B6, H-2b), C57BL/6J recombination activation gene-1 knockout mice (B6-rag1−/−, H-2b), C3H/HeJ (C3H, H-2k), and BALB/c ByJ, (BALB/c, H-2d) mice were obtained from The Jackson Laboratory (Bar Harbor, ME). Mice carrying the 2C TCR transgene were a gift from Richard Miller (University of Toronto, Toronto, Canada). 2C mice have been backcrossed >20 generations onto the B6 background. Animals received one of the following protocols: 1) anti-CD154 (CD40 ligand, MR-1; hamster IgG; cell line generously provided by R. Noelle, Dartmouth Medical School, Dartmouth, NH) 250 μg i.p. on day −1 (day 0 being the day of transplantation) and twice a week for 5 wk, 2) anti-CD154 with DST consisting of 2 × 107 BALB/c splenocytes administered retroorbitally 5–7 days before transplantation, 3) anti-LFA-1 (KBA; rat IgG2a; kindly provided by Dr. A. Ihara, University of Tokyo) initially administered in 100 or 200 μg/day doses for varying treatment periods as described in Results, or 4) anti-CD154 with the same dosing regimen as described in the first protocol in combination with anti-LFA-1 administered at 200 μg/day i.p on days 0, 1, 7, and 14. Control mice were treated with control rat IgG (Sigma-Aldrich, St. Louis, MO; 200 μg/day i.p on days 0, 1, 7, and 14), Syrian hamster IgG (Accurate Chemical, Westbury, NY) (250 μg i.p. on day −1 and twice a week for 5 wk), or combined rat IgG with hamster IgG at the same doses just described. In some experiments, peripheral CD4 T cells were depleted through mAb therapy. CD4 T cells were depleted with two doses of GK1.5 (19) (20 mg/kg/day) either at the time of transplantation (days −1 and 1 relative to transplant) or before adoptive transfer studies. Such treatment resulted in the reduction of CD4+ cells to <1% of lymphoid cells as assessed by flow cytometric analysis. BALB/c islets were isolated from adult mouse pancreata by collagenase (Sigma type V) digestion and Histopaque (Sigma-Aldrich) purification. B6 or B6-rag1−/− mice rendered diabetic (a minimum of two consecutive blood glucoses ≥ 20 mM) by the i.v. injection of 160 mg/kg streptozotocin (Calbiochem, La Jolla, CA) were used as allograft recipients. Diabetic recipients were subsequently grafted with 450 islets as described previously (4). Successful islet transplantation resulted in consecutive blood glucoses ≤ 10 mM. Graft function was assessed by monitoring blood glucose weekly with a Medisense (Waltham, MA) blood glucose meter. Transplant recipients were considered tolerant after bearing functioning grafts 100 days and subsequently resisting rejection (euglycemic >21 days) after immunization with 1 × 106 BALB/c spleen cells. At this point, in some animals, nephrectomy of the graft-bearing kidney was performed to definitively determine that euglycemia was graft dependent. A total of 50 × 106 pooled lymph node and spleen cells from 2C mice were inoculated i.v. into selected B6 mice 1–2 wk before transplantation and received either combined anti-CD154/anti-LFA-1 therapy as described above or no therapy. The clonotypic Ab 1B2-H6 was used to identify 2C cells (20). B6-rag1−/− mice, rendered diabetic with streptozotocin, were grafted with 450 islets from BALB/c (H-2d) mice as outlined above. At 2–7 days after transplantation, recipient mice were injected i.p. with 5 × 107 splenocytes from tolerant B6 mice or with 5 × 107 splenocytes from nontransplanted naive B6 controls. To test for dominant tolerance, 5 × 107 splenocytes from tolerant B6 mice were cotransferred with 5 × 107 splenocytes from nontransplanted naive B6 controls. Blood glucose was monitored twice weekly after immune reconstitution. Rejecting allografts were harvested after a minimum of two blood glucose readings >10 mM and were examined histologically. The graft-bearing kidneys of mice with functioning allografts were removed 60 days postreconstitution, and the blood glucose of these nephrectomized animals was monitored for the return to hyperglycemic values. To confirm immune reconstitution, flow cytometric analysis of peripheral blood and spleens was performed. At the conclusion of each study, kidneys bearing rejecting allografts or those removed by nephrectomy were fixed in 10% buffered Z-fix concentrate (Anatech, Battle Creek, MI). Paraffin sections were stained with H&E and, in parallel sections, insulin granules were detected with immunoperoxidase staining for insulin. Tissue sections were examined to determine the degree of tissue damage and mononuclear cell infiltration of the graft. CD4+ and CD8+ T cells were purified from B6 lymph node cells using Cellect T cell immune affinity enrichment columns (Cedarlane Laboratories, Hornby, Ontario, Canada). Enrichment of cell populations obtained from each column was assessed by flow cytometry and by the addition of anti-CD4 (GK1.5) or anti-CD8 (2.43; 21) to the MLR. Enriched CD4+ T cells had <0.5% contaminating CD8+ T cells and <1.4% B220+ B cells present. Enriched CD8+ T cells had <2.7% contaminating CD4+ cells and <3.8% B220+ B cells present. The MLR was established by mixing 2 × 105 enriched CD4+ or CD8+ T cells or unfractionated lymph node responders with 3 × 105 gamma-irradiated BALB/c splenic stimulator cells as previously described (4). Anti-CD154 or anti-LFA-1 Abs were added to wells at a final concentration of 50 μg/ml. Anti-CD4 and anti-CD8 Abs were added at 25 μg/ml final. Each group was assayed in quadruplicate cultures, and proliferative responses were determined by addition of 1 μCi/well of [3H]thymidine for 18 h. Cultures were harvested on a Tomtec Harvester 96 Mach III-M cell harvester (Hamden, CT) on days 3 and 4, peak proliferation days for CD8 and CD4 T cell cultures, respectively. [3H]Thymidine incorporation was detected on a Wallac beta counter (Gaithersburg, MD). As described previously (4), MLR and CTL assays were performed using spleen cells from tolerant hosts after immunization with donor-type spleen cells >100 days posttransplantation. The Mann-Whitney nonparametric U test was used to compare graft survival between groups. For purposes of this study, all grafts surviving beyond 100 days were assigned the value of 100. All adoptive transfer transplants surviving beyond 60 days were assigned the value of 60. The survival benefit conferred by anti-CD154 with or without DST or anti-LFA-1 in an experimental model of islet allograft transplantation was studied. B6 recipients were more prone to rejection with these therapies compared with BALB/c recipients in which these therapies led to 80–95% survival rates (4, 22). The adjunctive use of DST has been shown previously to be an important feature of graft prolongation induced by anti-CD154 therapy (5, 10). Costimulation blockade with anti-CD154 led to effective (but not uniform) BALB/c allograft acceptance with or without DST in 60–80% of B6 transplant recipients (Fig. 1⇓A). In parallel experiments, anti-LFA-1 monotherapy resulted in effective but not uniform BALB/c islet allograft acceptance in B6 recipients. The efficacy of anti-LFA-1 therapy was not improved by either increasing Ab doses or giving a protracted treatment course (Fig. 1⇓B); varied regimens achieved prolonged allograft survival in 40–60% of these transplanted animals. Previous studies indicated that the addition of depleting anti-CD8 Ab to anti-LFA-1 therapy did not improve these results (4), suggesting that CD8 T cells were not responsible for the resistance of some animals to anti-LFA-1-induced graft prolongation. Thus, although either anti-CD154 or anti-LFA-1 therapy was efficacious for prolonging allograft survival, these monotherapies did not result in uniform islet allograft acceptance. Survival of islet allografts with anti-CD154 or anti-LFA-1 mAb therapies. A, Diabetic B6 mice were transplanted with BALB/c islets and treated with anti-CD154 with or without the addition of DST. Both therapies effectively prolonged islet allograft survival compared with control hamster IgG Ab (p < 0.05). B, Diabetic B6 mice bearing BALB/c islet allografts were treated with several dosing regimens of anti-LFA-1. All protocols were superior to rat IgG control Ab (p < 0.005 for all groups) and no statistical difference existed between treatment groups. Graft survival with anti-LFA-1 therapy was not significantly different from anti-CD154 treatment. In parallel studies, the in vitro activities of anti-CD154 and anti-LFA-1 on alloreactivity were examined. Regarding T cell expression, CD154 is present predominantly on activated CD4+ cells, whereas LFA-1 is present on both resting and activated CD4+ and CD8+ cells (23, 24). Because the CD8+ T cell has been shown to be important in costimulation blockade resistance in B6 mice (10, 12), anti LFA-1 therapy could provide a direct anti-CD8 activity not seen using anti-CD154. Anti-LFA-1 or combined anti-CD154/anti-LFA-1 strongly inhibited MLR reactivity, whereas anti-CD154 had little effect on in vitro proliferation (Fig. 2⇓A). In contrast, anti-CD154 or combined anti-CD154/anti-LFA-1 effectively blocked CTL generation, whereas anti-LFA-1 was relatively ineffective in blocking specific lysis (Fig. 2⇓B). Thus, only the combination of Abs blocked both proliferative responses and CTL generation. The ability of anti-CD154 or anti-LFA-1 mAbs to inhibit either purified CD4 or CD8 T cell subsets was also determined in vitro (Fig. 2⇓C). When B6 responder cells were enriched for CD4+ and CD8+ T cell subsets, anti-CD154 inhibited CD4+ but not CD8+ T cells, whereas anti-LFA-1 significantly inhibited both subpopulations of cells. Thus, the combined use of anti-CD154/anti-LFA-1 treatment resulted in profound inhibition of both CD4 and CD8 T cells, supporting the potential utility of combining these two agents in vivo to prevent allograft rejection. In vitro effects of mAbs. A, B6 lymph node cells were cultured with irradiated BALB/c splenocytes. Anti-CD154, anti-LFA-1, control Ig, or no Ab was added to culture at a final concentration of 50 μg/ml. Cultures were pulsed with [3H]thymidine on days 3, 4, and 5. Anti-LFA-1 and combined anti-CD154/anti-LFA-1 inhibited MLR responses, whereas anti-CD154 did not. B, Day 5 CTL responses were inhibited by anti-CD154 and combined anti-CD154/anti-LFA-1 but not by anti-CD154. This experiment was repeated twice. C, B6 lymph node cells, enriched for either CD4+ or CD8+ T cells, were cultured with irradiated BALB/c splenocytes. 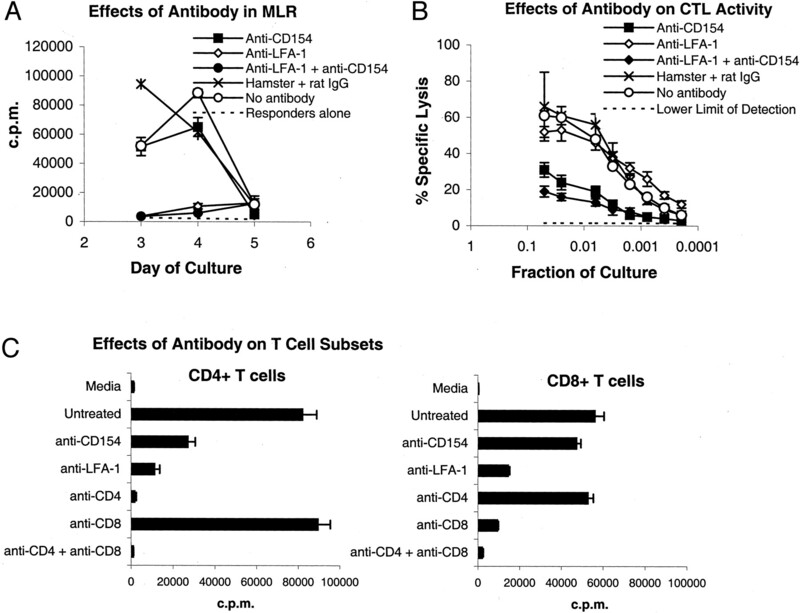 Anti-CD154 or anti-LFA-1 was added to cultures at a final concentration of 50 μg/ml. T cell purification was demonstrated by addition of anti-CD4 or anti-CD8 Abs (final concentration of 25 μg/ml). Cultures were pulsed with [3H]thymidine for 18 h and harvested on the peak day of proliferation (day 3 for CD8+ T cells and day 4 for CD4+ T cells). Unfractionated lymph node cells (data not shown) were assayed on both days. Data represent results for one of three replicate experiments. Subsequently, the efficacy of combined anti-CD154/anti-LFA-1 therapy was tested in vivo. This treatment was strikingly effective in vivo by promoting uniform (29 of 29) long-term acceptance (>100 days) of BALB/c islet allografts in high-responder B6 recipients, a result significantly different from either monotherapy (p < 0.05; Fig. 3⇓). Because many forms of allograft tolerance demonstrate CD4 T cell dependence in vivo, we determined whether the generation of long-term allograft survival after anti-CD154/anti-LFA-1 therapy was CD4 dependent by transiently depleting peripheral CD4 T cells during the peritransplant period. Depletion of CD4+ cells at the time of transplantation abrogated the effectiveness of this therapy with four of five anti-CD4-treated recipients spontaneously rejecting their islet allografts within 45 days posttransplant (Fig. 3⇓). Also, to investigate whether combined therapy resulted in gross lymphocyte depletion, mice were sacrificed 10 days after the initiation of therapy, and several lymphoid compartments were analyzed. Combined anti-CD154 and anti-LFA-1 therapy was not lymphocyte depleting in that total leukocyte cellularity and the proportion of CD4 and CD8 T cells or B cells did not differ between treated and control animals in peripheral blood (Fig. 4⇓) or in spleen (data not shown). In contrast, a known depleting anti-CD4 therapy (GK1.5) resulted in clearly reduced total cellularity and reduced CD4 T cells in treated B6 mice (Fig. 4⇓). 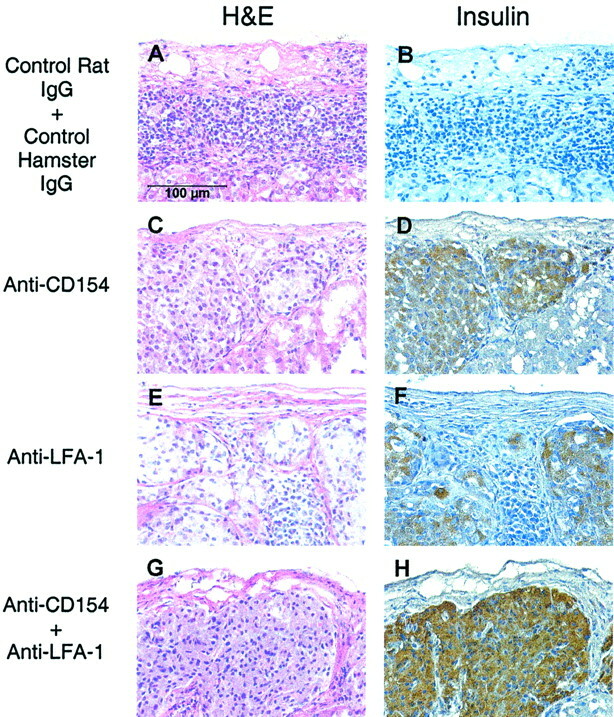 Combined anti-CD154/anti-LFA-1 therapy effectively prolongs islet allograft survival. Diabetic B6 mice were grafted with BALB/c islets and treated with a combination of anti-CD154 and anti-LFA-1 Abs or with control hamster IgG together with rat IgG. All recipients receiving combined therapy maintained their islet allografts for >100 days, which was significantly superior to control IgG therapy (p < 0.0005) and was more effective in prolonging islet allograft survival compared with individual anti-LFA-1 or anti-CD154 monotherapies (p < 0.05 for all groups). There was no statistical difference between anti-CD154 therapy with DST and combined therapy (p = 0.25). CD4 depletion at the time of transplantation decreased the efficacy of combined therapy (CD4-depleted combination therapy vs combination therapy; p < 0.0001). Combined anti-CD154/anti-LFA-1 mAb therapy does not deplete PBLs. B6 mice (n = 3/group) were treated with combination therapy, control rat and hamster IgG, or depleting anti-CD4 (GK1.5) Abs. 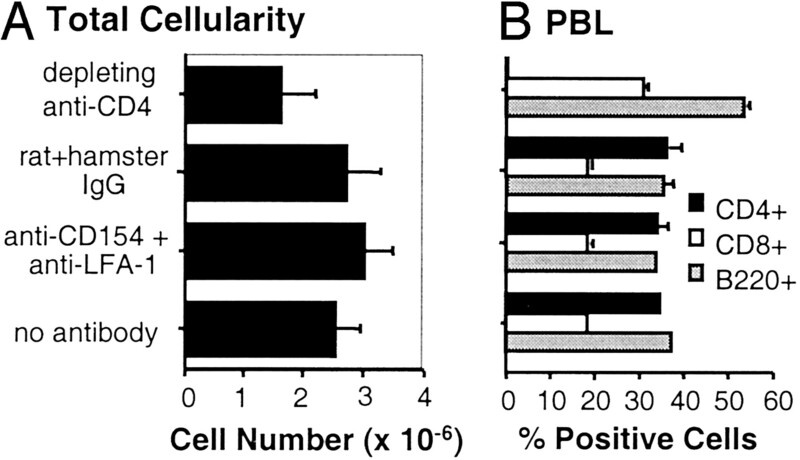 Ten days after the initiation of Ab therapy, lymphocytes from peripheral blood were counted (cells/ml) (A), and cell phenotype was analyzed by flow cytometry (B). Gated cells were 98–99% CD45+. Bars + SE represent the percentage of double-positive cells: CD45+CD4+, CD45+CD8+, and CD45+B220+ in each group. The nature of the putative tolerant state in mice bearing long-term islet allografts was then examined. To confirm that mice bearing long-term islet allografts were not merely immunologically “ignorant” of their transplants, mice were immunized with 106 donor-type splenocytes 100 days posttransplant. This represents a sufficient immunological challenge to trigger rejection of islet transplants that are accepted merely on the basis of immune ignorance (25, 26). The majority of these mice maintained normal graft function 3 wk after immunization with donor cells (anti-CD154 alone (10 of 10), anti-CD154 + DST (5 of 5), anti-LFA-1 (18 of 18), anti-CD154 + anti-LFA-1 (22 of 24)). Graft-dependent euglycemia in such animals was confirmed through nephrectomy of the graft-bearing kidney that resulted in prompt return to hyperglycemia. Histological examination of long-term functioning grafts revealed clearly intact islet tissue staining positively for insulin in contrast to acutely rejecting control grafts that showed complete destruction of tissue architecture and residual mononuclear cell infiltration (Fig. 5⇓). Long-term functioning islet allografts typically showed mild, noninvasive peri-islet mononuclear accumulation in all treatment groups. Histology of islet allografts. H&E and insulin stains of rejecting and long-term surviving islet allografts. A mononuclear cell infiltrate replaces the rejected allograft in mice treated with control Abs (A and B). Surviving islets of Langerhans demonstrate strong insulin staining under the kidney capsule where the transplant is grafted. Graft-infiltrating mononuclear cells were a feature common to all therapies (C—H). To determine whether the nature of the tolerance induced by the various treatment regimens was similar or distinct, an adoptive transfer assay was used to assess the presence or absence of regulatory tolerance. Specifically, we set out to determine whether any of the treatment protocols tested generated active, regulatory tolerance defined as the ability to inhibit rejection mediated by control, naive T cells. First, spleens from tolerant B6 mice were used to adoptively transfer tolerance to immunodeficient B6 rag-1−/− mice bearing BALB/c islet allografts. Using this straightforward adoptive transfer assay, mice reconstituted with spleen cells from anti-CD154, anti-CD154 plus DST, or anti-LFA-1 treatment groups were all found to significantly extend BALB/c islet allograft survival, compared with those mice reconstituted with B6 naive cells (13 of 13 reject; Fig. 6⇓). In parallel experiments, splenocytes derived from tolerant hosts were also examined for their capacity to inhibit the transfer of graft rejection by naive cells. To assess the presence of such “dominant” tolerance, equal numbers of spleen cells from tolerant and naive animals (5 × 107 each) were cotransferred to B6-rag-1−/− mice bearing donor-type islet allografts. Such cotransfer of naive cells with cells derived from anti-LFA-1-treated mice led to allograft prolongation in a proportion (4 of 11) of the grafted animals, but this prolongation was not significantly different from naive cells alone (Fig. 6⇓A). Interestingly, despite generating long-term allograft acceptance in the original islet recipients, none of the anti-CD154-treated animals with or without added DST generated a regulatory response sufficient to prevent rejection by naive spleen cells (Fig. 6⇓B). Thus, although anti-CD154 was effective in promoting graft acceptance, cells from these animals did not demonstrate the capacity to inhibit naive donor-reactive T cells in vivo when used at a 1:1 ratio. In contrast, cells from combined therapy recipients (anti-CD154/anti-LFA-1) showed pronounced prolongation of allografts when cotransferred with naive cells, a result consistent with the development of active, dominant tolerance (Fig. 7⇓). Only cells from the combined therapy group generated such regulatory activity, suggesting that anti-CD154 and anti-LFA-1 synergize to create a form of dominant tolerance. Furthermore, this regulatory tolerance was donor-specific in that third-party (C3H) grafts were acutely rejected after cotransfer of tolerant plus naive cell populations (Fig. 7⇓). The requirement for CD4 T cells from the tolerant host to mediate the expression of regulatory tolerance was assessed by depleting CD4+ cells from the tolerant host in vivo before adoptive transfer. Interestingly, depletion of CD4+ cells from tolerant spleens only partially decreased the transfer of dominant tolerance. The ability of untreated vs CD4-depleted tolerant spleen cells to inhibit rejection by naive cells was not statistically different (Fig. 7⇓). Tolerance with monotherapies. 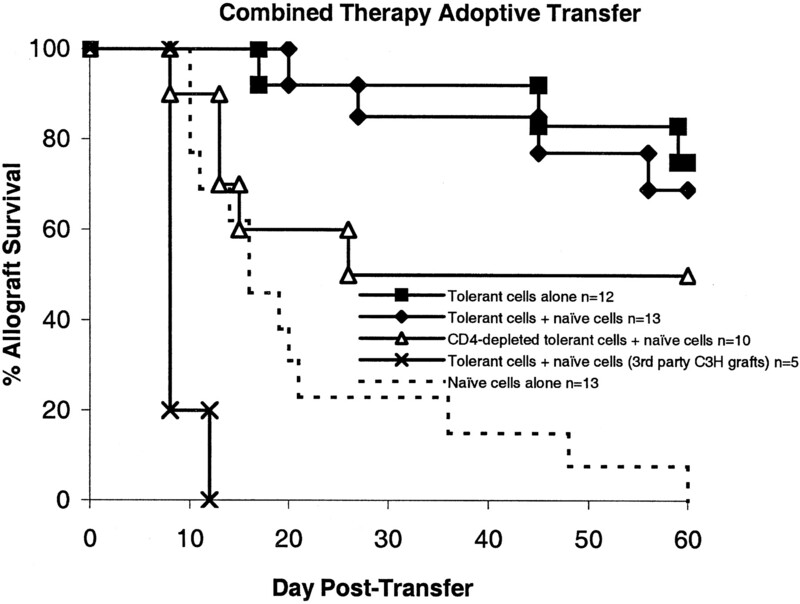 The nature of tolerance generated in animals from each monotherapy group was determined in adoptive transfer studies. B6-rag1−/− mice were grafted with BALB/c islets 2–7 days before reconstitution with either 5 × 107 naive B6 spleen cells, 5 × 107 tolerant spleen cells, or tolerant plus naive cells (5 × 107 of each). For comparison, the adoptive transfer with naive cells alone is shown in each panel. A, Nonreconstituted mice maintained functioning islet allografts, whereas all mice reconstituted with naive B6 spleen cells alone rejected their grafts. Anti-LFA-1-tolerant spleen cells demonstrated prolonged graft survival compared with controls (p = 0.005), whereas reconstitution with anti-LFA-1 tolerant plus naive cells was not significantly different from naive cells alone (p = 0.23). B, The transfer of spleen cells from anti-CD154-treated mice significantly prolonged allograft survival (p < 0.05), but this transfer was rendered ineffective when combined with naive spleen cells. Although allografts were not rejected when recipients were reconstituted with spleen cells from anti-CD154 + DST-treated mice (tolerant cells (DST); p = 0.007 relative to naive cells alone), no graft survival advantage was conferred when these cells were transferred with naive cells. Dominant tolerance with combined anti-CD154/anti-LFA-1 therapy. Reconstitution with spleen cells derived from animals receiving combined anti-CD154/anti-LFA-1 therapy led to prolonged allograft survival when transferred alone (p = 0.0005) or when transferred with naive cells (p = 0.0004), demonstrating the presence of a dominant form of tolerance. Dominant tolerance is donor specific with all third-party C3H islet allografts rejecting with first set kinetics (p = 0.002). Depletion of CD4 cells only partially interfered with the adoptive transfer of dominant tolerance (CD4-depleted tolerant combined therapy vs combined therapy, p = 0.18; CD4-depleted tolerant combined therapy vs naive cells alone, p = 0.21). The requirement for the gross deletion of donor-reactive T cells in mice receiving combined anti-LFA-1 plus anti-CD154 therapy was also determined. Spleen and lymph node cells from mice receiving combined therapy and bearing long-term islet allografts were used in MLR (data not shown) and CTL assays (Fig. 8⇓A). Proliferative (data not shown) and cytotoxic reactivity of spleen cells was comparable between tolerant and naive cells against both donor-type (BALB/c) and third-party (C3H; H-2k) stimulator cells (Fig. 8⇓A). This result was also found for lymph node cells (data not shown). This finding is consistent with previous results, suggesting that the deletion of donor-reactive cells is not required for the long-term maintenance of allograft survival after anti-LFA-1 monotherapy (4). Spleen cells obtained directly from B6-rag-1−/− mice reconstituted with tolerant plus naive cells and bearing surviving (>60 days) BALB/c islet allografts also had maintained robust donor-reactive CTL activity (Fig. 8⇓B) comparable to control naive spleen cell responses. Thus, regulatory tolerance could coexist with the presence of donor-reactive T cells, consistent with the idea that deletion is also not required in the maintenance phase of tolerance. Donor reactive T cells persist in the presence of dominant tolerance. Spleen cells were harvested from naive B6 mice or from anti-CD154/anti-LFA-1-tolerant B6 mice bearing BALB/c islet allografts for >100 days. A, Cytotoxic T cell responses after 5 days of primary culture with BALB/c stimulators were similar between tolerant and naive spleen cells. MLR and CTL data are representative of several replicate experiments. Error bars indicate the SE of triplicate or quadruplicate wells. Similar proliferative and cytotoxic responses were obtained with third-party strain (C3H, H-2k) stimulators (data not shown). B, Diabetic B6 rag1−/− mice grafted with donor-type (BALB/c) islet grafts were reconstituted with spleen cells from B6 mice bearing long-term functioning BALB/c islet allografts after combined anti-CD154/anti-LFA-1 treatment or with a mixture of “tolerant” plus naive spleen cells as described in Fig. 7⇑. Spleen cells then were analyzed at >60 days post-spleen cell transfer for anti-donor proliferative and cytotoxic activity as described in Materials and Methods. The dashed line indicates the lower limit of detection of specific lysis. Spleen cells from all sources cultured in medium alone were less than the lower limit of detection. Data are representative of three separate experiments. C, Transgenic 2C cells inoculated into B6 mice before islet transplantation did not diminish efficacy of combination therapy. Transgenic 2C cells were demonstrated to engraft in the B6 host before transplantation, and pilot studies indicated that 2C cells persisted in the peripheral circulation of tolerant mice for >60 days. To increase the stringency of the transplant model, donor-reactive TCR transgenic 2C T cells were infused into B6 mice before transplantation (Fig. 8⇑C). The 2C TCR is specific for the Ld MHC class I expressed by BALB/c mice (27). We have previously demonstrated that 10 × 106 2C CD8+ cells are sufficient to reject BALB/c islet allografts in reconstituted B6 scid/scid mice (28, 29). Based on preliminary dosing studies, B6 mice were inoculated with 50 × 106 pooled 2C spleen and lymph node cells 1–2 wk before transplantation (comprising ∼107 2C clonotypic+ T cells). 2C cells successfully engrafted in all B6 mice (0.60 ± .06% of PBLs vs 0.02% ± 0.01% of PBLs in unreconstituted controls). In all 2C-transferred B6 mice (n = 6) receiving combined Ab therapy, islet allograft survival was prolonged 60 days, whereas all untreated mice rejected their islet allografts. Pilot studies investigating the fate of these alloreactive transgenic T cells over time suggest that, with combination therapy, transgenic cells survive at least 60 days after transplantation (data not shown). Thus, we have not detected demonstrable deletion of CTLs in either the generation or maintenance phases of dominant tolerance induced by combined anti-CD154/anti-LFA-1 therapy. Thus, the expression of dominant tolerance did not require a corresponding elimination of potential donor-reactive T cells. This study tested permutations of mAbs directed to the cell-surface molecules CD154 and LFA-1 for their relative efficacy to promote islet allograft survival and tolerance. Previous studies have shown that both costimulation and adhesion blockade are effective in blunting host immune responses to the extent that long-term graft acceptance is possible with only a limited period of therapy (4, 11, 30, 31, 32). Given that a general tenet of combinational approaches to treating diseases is to target conceptually distinct pathogenic pathways, it was unclear whether agents specific for differing immune pathways (i.e., LFA-1:adhesion/homing/costimulation and CD154:costimulation) would lead to similar or different modes of transplantation tolerance. Results demonstrate that the simultaneous targeting of anti-CD154 and anti-LFA-1 not only led to improved islet allograft survival in high-responder recipients, but it also led to the unexpected generation of dominant, transferable transplantation tolerance. The development of a strategic therapy for promoting allograft prolongation should consider the subset(s) of T cells to be targeted by the putative therapy. For example, the type of transplant being evaluated is relevant because the effector cells of interest may vary in an organ- or tissue-specific fashion. For example, CD4+ cells are sufficient for cardiac allograft rejection (33, 34), whereas CD8+ cells are the important effectors of rejection in murine models of islet transplantation (29, 35). Furthermore, the host genetic background introduces an important variable when designing a therapy because some transplant recipients have a lower relative proclivity to reject an organ (low responders), whereas others are quite difficult to tolerize (high responders). In particular, therapies that are effective in certain strains lose potency in “black” background strains (4, 12, 36). Germane to this study was the finding that some strains of mice have especially potent CD4-independent CD8 T cell reactivity. Importantly, this activity has a genetic basis (37, 38) and has been shown to negatively impact conventional allograft tolerance (10, 12). For example, the B6 and related strains demonstrate strong “helper-independent” CD8 T cell reactivity that makes these animals very difficult to tolerize using costimulation blockade regimens (10, 12), a strain-specific property also observed with anti-LFA-1 therapy (4). Adding a depleting anti-CD8 monoclonal therapy to costimulation blockade tolerance (10, 12) or using animals with genetic differences in CD8 reactivity (38) can result in greatly prolonged allograft survival, strongly implicating CD8 T cells in the resistance to tolerance. Interestingly, the autoimmune-prone nonobese diabetic mouse has also demonstrated a deficiency in CD8 T cell peripheral tolerance (39) that potentially may contribute to the relative resistance to allograft tolerance found in this strain. Therefore, one aim of this study was to test whether combining nondepleting mAbs would effectively inhibit both CD4 and CD8 T cells in a fashion not found by individual monotherapies. Of note, combined anti-CD154/anti-LFA-1 was potent enough to prevent rejection, despite the transfer of donor-specific transgenic 2C CD8+ cells to the responding B6 host. Other studies have clearly demonstrated the efficacy of promoting graft survival and tolerance through the direct simultaneous blockade of CD4 and CD8 T cells (36). Given that anti-LFA-1 effectively prevents the generation of the CD8+ responses in vitro (40, 41), this appeared to be an ideal complementary therapy for augmenting anti-CD154 efficacy in vivo. A recent study indicating that CD154-independent rejection is LFA-1 sensitive is consistent with this view (42). Although this combined approach resulted in improved graft survival relative to individual monotherapies, the finding that this combination of Abs actually synergized to generate dominant transplantation tolerance was somewhat unexpected. The mechanisms by which T cell Abs work to prolong allograft survival have been greatly debated (43). A fundamental question that arises is whether tolerance is due to a loss of function (e.g., deletion/anergy of donor-reactive cells), a gain of function (e.g., the generation of regulatory cells), or both. Evidence exists that costimulation blockade with anti-CD154 promotes the apoptosis of graft-reactive T cells (44, 45) and the deletion of CD8 T cells when used in combination with DST (46, 47). The fact that the effective adoptive transfer of tolerance in the anti-CD154 plus DST group was abrogated when cotransferred with naive cells is consistent with this idea that the mechanism of tolerance with this therapy owes more to clonal deletion/anergy than regulatory tolerance. Other evidence indicates that anti-CD154 monotherapy can result in active, regulatory tolerance in vivo (48), though this property involved adjunct anti-CD8 therapy, a result consistent with the current study. Thus, although targeting CD154 has been shown to be dramatically effective in preventing allograft rejection, the current results as well as previous reports suggest that this approach is less effective in generating active tolerance. If regulatory T cells were generated by costimulation blockade alone (anti-CD154) in this study, they were inadequate in the current model to overcome the rejection response of naive T cells. This would explain why thymectomy of the allograft recipient in some cases is important for promoting long-term allograft acceptance in anti-CD154-treated recipients (10, 32). That is, although anti-CD154 may block or even transiently promote deletion of donor-reactive T cells, the corresponding generation of regulatory tolerance may not be sufficient to inhibit the activity of new thymic emigrants that emerge after the cessation of therapy. The histologic appearance of host lymphocytes at the graft site illustrates that simple blockade of migration is not sufficient to explain long-term engraftment. Furthermore, as tolerance after anti-LFA-1 therapy can be adoptively transferred to immunodeficient mice (4, 49), some form of immunomodulation must occur. It has become clear that LFA-1/ICAM interaction can have important costimulatory activity (50, 51, 52, 53), such that Ab therapy that interferes with this ligand interaction may itself be an alternate form of costimulation blockade. Although a primary hypothesis is that the contribution of anti-LFA-1 therapy in combination with anti-CD154 is primarily an effect on CD8 T cells, this suggestion requires additional testing. Another possibility is that anti-CD154 augments anti-LFA-1 by blocking anti-Ig responses, leading to an extended half-life of anti-LFA-1 xenoproteins. The development of regulatory tolerance remains a key goal for strategies that promote stable long-term allograft survival. Dominant tolerance in transplantation was first demonstrated by Hall and colleagues (54, 55), who showed that cotransfer of CD4+ cells or T cell-enhanced spleen cells from tolerant rats was capable of suppressing rejection of cardiac allografts by normal lymph node cells in an adoptive transfer model. Subsequently, regulatory CD4+ T cells have been demonstrated in multiple models of transplantation tolerance (reviewed in Ref. 36). The exact phenotype of putative regulatory cells is widely debated. CD45RBlow CD4+ and CD25+CD4+ T cells may represent memory subpopulations critical to the maintenance of self- and/or transplantation tolerance (56, 57, 58, 59). The cotransfer of CD45RBlow CD4+ cells from tolerant mice can suppress secondary skin transplant rejection mediated by CD45RBhigh CD4+ cells in an IL-10-dependent fashion (59) and do not depend on Fas-FasL interactions (60). Another recent study has implicated intact CTLA4 pathways as essential for dominant transplantation tolerance (8). It will be important to determine whether dominant tolerance generated by combined anti-CD154/anti-LFA-1 therapy is similar or distinct from these putative regulatory mechanisms. Initial experiments indicate that the nature of regulatory tolerance in the current studies may differ somewhat from other models showing a requirement for CD4 T cells for mediating the tolerant state. In the present study, the initial generation of regulatory tolerance was CD4 dependent in vivo, consistent with other allograft models. Interestingly, however, the ability to transfer established tolerance was only partially inhibited by depleting CD4 T cells from the tolerant cells, suggesting that other cell types may contribute to the regulatory state. This finding is consistent with an intriguing recent study indicating that dendritic cells “conditioned” in vivo can adoptively transfer tolerance in the absence of CD4 T cells (61). Thus, the present results suggest that non-CD4 T cells may participate in the active tolerant state, possibly through altered Ag presentation by tolerant animal-derived APCs (61). This will be an important issue to be addressed in further studies. An important additional conclusion of this study is that allograft survival is not synonymous with active, regulatory tolerance. That is, long-term graft acceptance, at least for islet allografts, can be unlinked from dominant tolerance. In comparing differing therapies used in this study, the gross histologic appearance of the allograft and the in vitro anti-donor proliferative responses were similar among animals treated with anti-LFA-1 alone, anti-CD154 alone, or the combination of these Abs. However, only the later group demonstrated robust dominant tolerance when assayed through cotransfer experiments with naive cells. It should be noted that there could be quantitative differences between the “tolerant” state induced by varying therapies that were not detected by the adoptive transfer condition described. That is, the ability to adoptively transfer regulatory tolerance may be dependent on the relative numbers of both naive and putative regulatory cells cotransferred (8, 59, 62), possibly under-representing the potential regulatory activity induced by some therapies. Nevertheless, the assay conditions described indicate a marked relative difference in the capacity of dual anti-CD154/anti-LFA-1 therapy to induce dominant regulatory tolerance as compared with individual monotherapies. Thus, results demonstrate that a strategic combination of agents directed against distinct molecular targets involved in immune function can synergize for the unexpected generation of dominant transplantation tolerance. In summary, this study demonstrates that combined anti-CD154/anti-LFA-1 effectively targets both CD4 and CD8 T cells responsible for islet allograft rejection. This treatment in vivo is non-lymphocyte-depleting and results in profound islet allograft survival and active tolerance in a high-responder mouse strain. Combined therapy was efficacious even in the presence of potentially graft-destructive TCR transgenic 2C cells. The therapy is pragmatic because it can be initiated near the time of transplantation, unlike some DST protocols. Furthermore, this combinational therapy synergizes to generate transferable, dominant allograft tolerance not found using individual monotherapies. As such, this protocol contains several features that would be highly attractive for clinical application. We thank A. Bolwerk, Nanette Gomez, and Nate Kuhl for excellent technical assistance. ↵1 This work was supported by the National Institute of Diabetes and Digestive and Kidney Diseases (Grant K08 DK02704 to M.R.N., Grant RO1 DK33470 to R.G.G., and Grant DERC P30 DK57516). ↵2 M.R.N. and M.C. shared equal contribution. ↵4 Abbreviations used in this paper: DST, donor-specific transfusion; B6, C57BL/6; rag1−/−, recombination activation gene-1 knockout.